Micro chip attatched ! These are the same as the Genuine Inks simply install and print. They show the correct ink levels and the little red light comes on when you install them. You can select any combination of 5 cartridges with this pack if you don't want the standard 1 of each. Simply write the combination you want in the comments box on the checkout page. Hi Guys. Just had to write and congratulate you on your truly excellent service, and you keep on doing it every time I place an order. Plus your web site is so easy to use, Top Marks, you all deserve a big pay rise, or at least a huge pat on the back. Outstanding service , fast delivery and quality product and a very reasonable price. Received a phone call straight away to clarify a concern . Highly recommend the company and their products. Excellent quality, very fast delivery. Easy website to use, tracking number provided for my order. Very professional company. I would not hesitate to recommend them to other people. The most amazing service ever, thank you. Great product, great price, fast delivery and fantastic customer service. A truly great Australian business. Super fast delivery and up and running within 5 mins. I was very impressed. It was at least half the cost. Will be ordering again for sure. Fabulous product and service. These Canon cartridges light up and also show the correct ink levels. I purchased the Canon MG 5760 after reading the Ink Hub Blog pages and I am very glad that I did. I have previously only used the brand name cartridges but with the price saving I wont be any more. One very happy, happy customer ! Excellent service, FAST delivery and good product quality. I have now used Ink Hub for several years and will continue to do so. Arrived today.....fantastic service with Express Post,well done guys..inks are the best also, many thanks..only place to buy inks! Very high quality printouts from these generic ink cartridges. I am more than happy with the price and delivery time. Less than half the price of the Canon equivalents and they are printing well. Very impressed with the person I spoke to on the phone at Ink Hub and I appreciated your advice on the Canon printer as I am very happy with the way it performs. When will my Canon PGI 670XL/CLI 671XL Value Pack be delivered ? 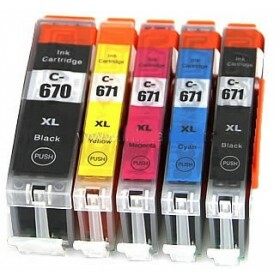 Your Canon PGI 670XL/CLI 671XL Value Pack comes with a 60 Day Money Back Guarantee. Our Guarantee is rock solid! Unlike other online stores selling Generic Cartridges we stand behind all of our products. If you have any issues whatsoever with your products simply call our office and we will sort it out immediately. Our generic cartridges are all brand new NOT refills. 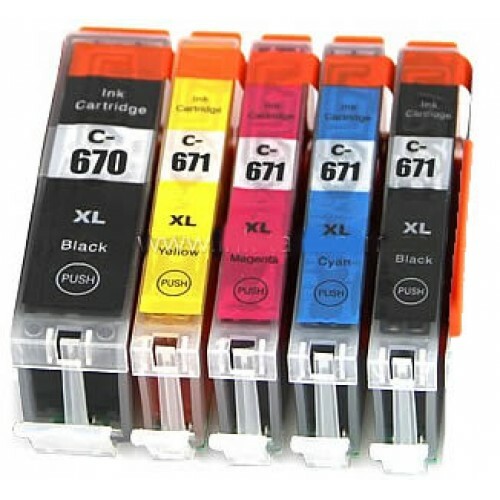 Will these generic Canon PGI 670XL/CLI 671XL cartridges give me a good page yield? Yes they will, we guarantee that they will work faultlessly and also that they will show the correct ink levels just like the more expensive Canon cartridges do. Don't waste your valuable money at Officeworks on genuine ink when our cartridges are almost a third the price of the genuine cartridges.